About 2,000 people have gathered to honour the memory of police officers who lost their lives in the line of duty. Relatives and colleagues joined dignitaries, including Home Secretary Sajid Javid, in Belfast on Sunday to take part in the 15th annual National Memorial Day event commemorating those who have served across the UK. Candles were lit by relatives and the names of officers, who died in the last 12 months, were read aloud during the service at Waterfront Hall. Honoured to be attending National @Police_Memorial service today in Belfast. The bravery, courage & sacrifice of over 4,000 officers who, since British policing began, have died on duty, will never be forgotten. A guard of honour made up of representatives from forces throughout the UK and overseas welcomed people on arrival. He said the UK had seen a number of significant attacks in the last 12 months where police officers had “saved lives” and “thwarted attacks”. Attendees heard of the dangers officers face and the sacrifices they make in the course of their duties. More than 4,400 officers have died since modern policing began across the UK. Among those specifically remembered was Constable Michael John Ferguson, who was shot dead outside a shopping centre in Londonderry in January 1993 at the age of 21. His brother and sister Joseph and Susan Ferguson lit a candle for him. Constable James Dixon of Thames Valley Police was remembered by his wife Samantha and his son Parker Cameron James Dixon, who was named after his late father. Constable Dixon died in a collision last December while working, and never got to meet his son. Relatives of other officers killed in the line of duty represented Wales and Scotland as they too lit candles. 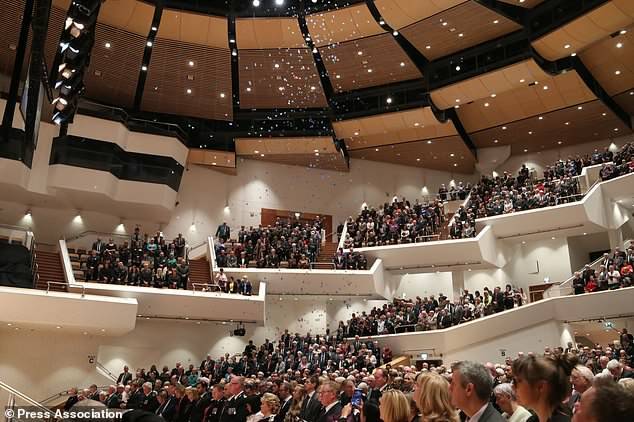 Prayers were offered by family members and, as the Last Post sounded, petals descended from the gallery above the hall to represent those who died. A wreath was also laid to mark the centenary of the end of World War I and remember all those who died during the war, including officers. Police Federation of England and Wales chairman John Apter said it was a day to remember and reflect and also celebrate the lives of those that they had all lost. “I know from speaking to families who have lost loved ones that [the day] is significant for them, it’s important,” Mr Apter said.